heinnews’s David Hein headed out for some live hoops last week and met up with Germany’s new national team coach Frank Menz at the Bayern Munich-ratiopharm ulm game. 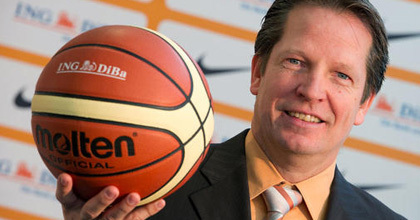 They talked about the contest; both teams having a number of German national team players on their teams; and Germany’s chances at EuroBasket 2013.
heinnews: Frank Menz, first off, Happy New Year and congratulations on becoming the German national team coach. heinnews: We are at the Bayern Munich-ratiopharm ulm Beko BBL game. What are your thoughts on the contest, which Bayern won 80-78? Menz: It had a bit of a playoff character. There were a lot of emotions and it was very intense. I think both teams can be satisfied. Ulm had a couple of scenes at the end which were a little forced and Bayern took advantage of those. But altogether, it was a very good game. heinnews: Both of these teams use a lot of German players in their rotations. While Bayern have Robin Benzing, Jan Jagla, Steffen Hamann and Demond Greene, Ulm at times played with four Germans on the court at one time – Per Günther, Daniel Theis, Philipp Schwethelm and Sebastian Betz. What do you think about the development regarding the push for German talent in this country? Menz: Altogether I think the development is really good. We don’t just see that in this game. The German players here are generally also players who are on the court when the game is on the line. And all of them play a good role. That’s a good development, for basketball in Germany as well as the clubs, who have players fans can identify with. heinnews: You were appointed new German national team coach on December 6. How have you spent your first month on the job? Menz: I spent the time until Christmas tying up some loose ends – such as the youth sighting camps and other things. Then I spent a couple days with the family and now things are picking up. I am visiting with the clubs and talking to the coaches and players. And then I will put together my concept. heinnews: Germany were drawn into Group A at EuroBasket 2013 in Slovenia along with Ukraine, Great Britain, Israel, Belgium and France. What do you think about the group in Ljubljana? Menz: I think all of the opponents at EuroBasket will be tougher than the opponents we had in the qualification. So I think it will be a very difficult first round. Both Ukraine and Great Britain have strong teams. Israel traditionally have good teams. The Belgians played strong in the qualification and then you have a title candidate with France. I am certain that we will do a good job and our goal is definitely to reach the second round. Let’s see. heinnews: What’s the key to reach the second round? Menz: First of all we have to put together the best team possible. That’s the most important part. And then we have to hope that the guys remain healthy. And then we hope to have a good preparations and give our all.